Sometimes the old saying, ‘every cloud has a silver lining’, seems true. Today my trio was due to start making a record, at a studio in a rural location near the Welsh border. It’s a good four hours’ drive from my house at the best of times. We only agreed to go so far afield because Henry Wood Hall, our favourite London recording venue, was not available. But Britain is in the grip of unusually harsh winter weather; travellers’ tales filtered through, and the journey began to look foolhardy. We agonised about whether to attempt it anyway. Making a record feels like an important occasion, to which we have been building up for some time, and it goes against the grain to postpone. But would we be risking life and limb? Fortunately, the director of the record company looked at the weather forecast for this weekend and sensibly took the decision out of our hands. 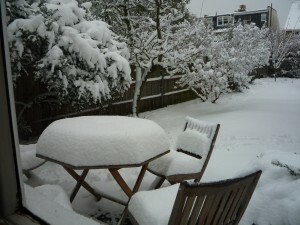 The sessions in the West of England were cancelled. By now we had heard of so many travel problems that we realised there must also be people who had been unable to reach London in the snowy conditions. So we began to wonder if we might have a chance of finding a studio in London at short notice. Lo and behold, it transpired that Henry Wood Hall had just received notice of a cancellation for the exact three days that we needed. And even better, it turned out that one of my favourite Steinway pianos was suddenly available for those three days as well. So a week of staring out of the window at the snow and worrying has ended with our whole project being rescheduled in London. We can all go home at the end of each day’s work. No long drives in the snow, and even better, no long drive back at night after the final session. This entry was posted on Monday 11th January 2010 at 12:00pm	and is filed under Florestan Trio, Musings, Travel. You can leave a response, or trackback from your own site. There’s an old saying: When one door closes, another one opens. Seems to have been literally true in this case!